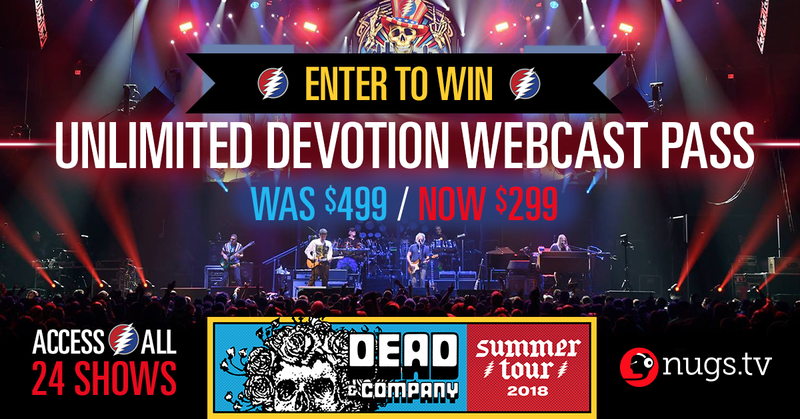 Win a Dead & Company Webcast Tour Pass! The tour is counting down but the music is heating up! As we approach the final few weeks of tour, we're discounting the 'Unlimited Devotion' HD Webcast pass - and we're putting one up for grabs! One lucky entrant will win a free pass, giving them access to all 24 webcasts, live or on-demand. Three additional winners will receive a Gorge / Eugene 2-Show HD Webcast Pass for this Friday and Saturday. No purchase is necessary. Simply enter your email address and accept the terms. Sign up for the nugs.net newsletter to stay in the loop on newly released recordings, webcast announcements, giveaways and more. This promotion will only run for a very short time, ending Friday afternoon, so enter now. Good luck! *See official rules, by clicking 'Enter to Win' you hereby agree to the terms set forth. No purchase necessary. Enter online by 3:59pm ET - Friday June 29, 2018. Must be 18+ to enter and a resident of the US. Winners will be emailed on Friday June 29, 2018.